The construction of this type of motors is similar to the resistance split phase type. 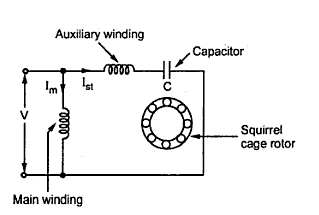 The difference is that in series with the auxiliary winding the capacitor is connected. The capacitive circuit draws a leading current, this feature used in this type to increase the split phase angle α between the two currents Im and Ist. The connection of capacitor start motor is shown in the Fig. 1(a). The current Im lags the voltage by angle Φm while due to capacitor the current Ist leads the voltage by angleΦst. Hence there exists a large phase difference between the two currents which is almost 90o , which is an ideal case. The phasor diagram is shown in the Fig.1(b). The starting torque is proportional to ‘α ‘and hence such motors produce very high starting torque. 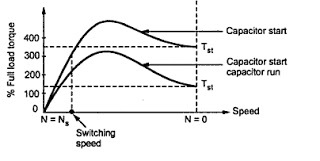 When speed approaches to 75 to 80% of the synchronous speed, the starting winding gets disconnected due to operation of the centrifugal switch. The capacitor remains in the circuit only at start hence it is called capacitor start motors. Key point : In case of capacitor start capacitor run motor, there is no centrifugal switch and capacitor remain permanently in the circuit. This improves the power factor. The schematic representation of such motor is shown in the Fig. 2. The phasor diagram remains same as shown in the Fig.1(b). The performance not only at start but in running condition also depends on the capacitor C hence its value is to be designed so as to compromise between best starting and best running condition. Hence the starting torque available in such type of motor is about 50 to 100% of full load torque. 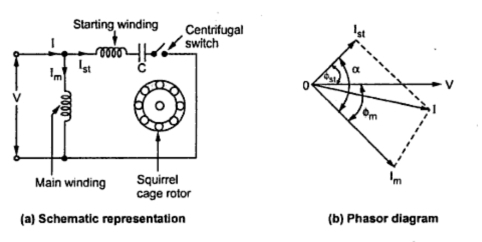 The direction of rotation, in both the types can be changed by interchanging the connection of main winding or auxiliary winding. The capacitor permanently in the circuit improves the power factor. These motors are more costly than split phase type motors. The capacitor value can be selected as per the requirement of starting torque, the starting torque can be as high as 350 to 400 % of full load torque. 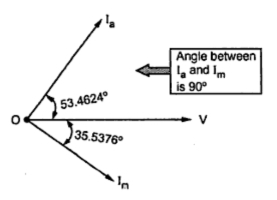 The torque-speed characteristics is as shown in the Fig.3. These motors have high starting torque and hence are used for hard starting loads. These are used for compressors, conveyors, grinders, fans, blowers, refrigerators, air conditions etc. These are most commonly used motors. The capacitor start capacitor run motors are used in celling fans, blowers and air-circulations. These motors are available upto 6 kW. Example : A 250 W, 230 V, 50 Hz capacitor start motor has the following impedances at standstill. 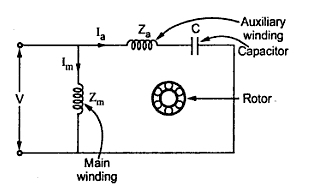 Find the value of capacitor to be connected in series with the auxiliary winding to give a phase displacement of between the currents in two windings. Draw the circuit and phasor diagram for motor. 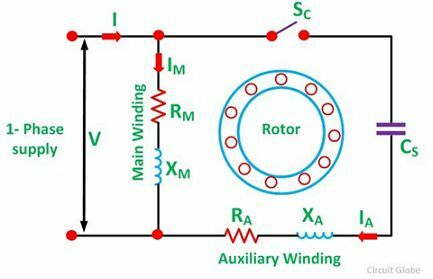 Solution : Let Xc be the capacitive reactance to be connected with auxiliary winding at start, as shown in the Fig. 1(a). Now Ia and Im must have a phase difference of 90o. Im will lag the voltage by 35.5376o hence Ia must lead the voltage by (90o– 35.5376o ) i.e. 53.4624o , as shown in the Fig 1(b). tan(-53.4624o ) = (5 – Xc )/11.5 i.e.